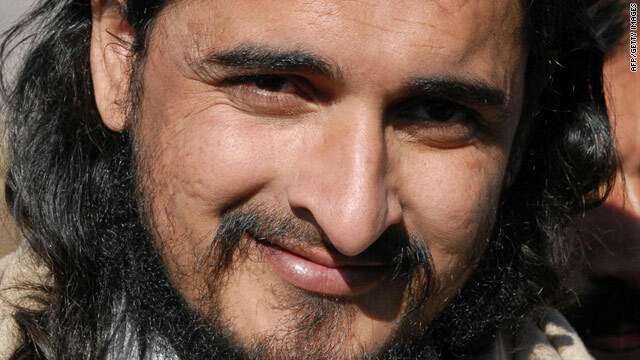 Sources say Pakistani Taliban leader Hakimullah Mehsud, here in November 2008, was injured in a suspected U.S. drone strike. NEW: Speaker declares he is "alive and in good health"
Islamabad, Pakistan (CNN) -- The Taliban in Pakistan have released a second audiotape purportedly containing the voice of their leader, Hakimullah Mehsud, who sources say was wounded in a suspected drone strike this week. The group also released an audiotape Friday, though CNN could not confirm that the voice on either tape belongs to Mehsud. It was unclear whether the first tape was recorded before or after Thursday's drone strike, but the voice on the second tape announced the date as Saturday. "Let me say this briefly, that I, Hakimullah Mehsud, today, on the 16th of January, with central spokesman Azam Tariq and Umar Khittab, want to give this message to all mujahedeen: that by the grace of Allah, I, Hakimullah Mehsud, am alive and in good health. Neither have I been martyred in a drone attack nor injured," the voice says on Saturday's tape. Tariq, a Taliban spokesman, denied Thursday and again Friday that Mehsud was hurt. Tariq said Mehsud had left the site of the attack -- a converted religious school -- before the missiles struck. He dismissed reports of an injury to Mehsud as propaganda. However, other Taliban and intelligence sources said doctors were treating Mehsud for wounds he sustained in the drone strike. Tariq delivered both audiotapes to local journalists. On the tape released Friday, the voice says, "The media right now is also part of the war. The enemy through the media wants to demoralize the Taliban. At times they spread the propaganda in the media that 'We have martyred Hakimullah.' At other times they say, 'We have completed the operation in South Waziristan,' but this will never happen." The drone strike hit a madrassa, or religious school, that local officials said had been converted into a militant training camp. Ten people were killed in the strike, Pakistani intelligence and local officials said. In the Friday tape, the speaker warns of what will happen if the drone strikes continue. "I want to inform the Pakistani people that the drone attacks that take place in the tribal areas endanger the politics, well-being and sovereignty of Pakistan," the speaker says. "From today onward, for any dangerous step that the Pakistani Taliban will take in Pakistan, those responsible will be Pakistan's rulers, not the Taliban. This is because the Pakistani rulers want to spill the blood of the innocent [tribesmen] in exchange for dollars." The U.S. military routinely offers no comment on reported attacks by drones, or unmanned aircraft. The United States is the only country operating in the region known to have the ability to launch missiles from remote-controlled aircraft. Last week, the Taliban released a video showing Mehsud sitting next to Humam Khalil Abu-Mulal al-Balawi, the man who killed seven CIA employees and a Jordanian army captain at an eastern Afghan base December 30. The Pakistani Taliban claimed responsibility for that attack. It was carried out out to avenge the death of Mehsud's predecessor, Baitullah Mehsud, who died in a suspected U.S. drone strike last year, according to al Qaeda's commander of operations in Afghanistan, Mustafa Abu Yazid. Baitullah Mehsud and Hakimullah Mehsud are from the same tribe, but not from the same family. CNN's Pierre Bairin contributed to this report.